Karim “Hard Hitta” Mayfield (20-4-1, 11 KOs), cruised to a 6-round unanimous decision over outmatched Miguel Dumas (10-0, 7 KOs), giving him his first defeat. With the win, Mayfield captures he the WBU Welterweight Americas Belt. Scorecards read 60-54 twice, and 55-54. Middleweight, Raquel “Pretty Beast” Miller (5-0, 3 KOs) remained undefeated with a 1stround knockout against Lisa Garland (15-9, 8 KOs). Time was 2:00 of round one. Ricardo Pinell (15-3-1, 8 KOs) won a lopsided unanimous decision against Carlos Ruiz (8-4, 3 KO) in a 6-round middleweight bout. Score cards read 60-54 across the board. 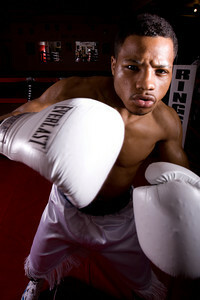 Will Shaw (3-0, 3 KOs) defeated Lenard Davis (1-0-3) with a 2nd round TKO in a scheduled 4-round super lightweight bout. Time was .50 of round two.